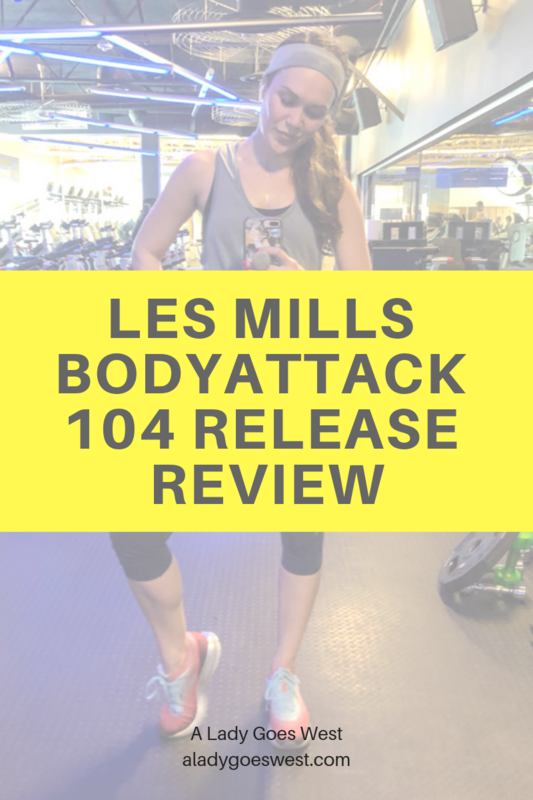 Remember when I used to write detailed blog post reviews of the latest Les Mills releases? 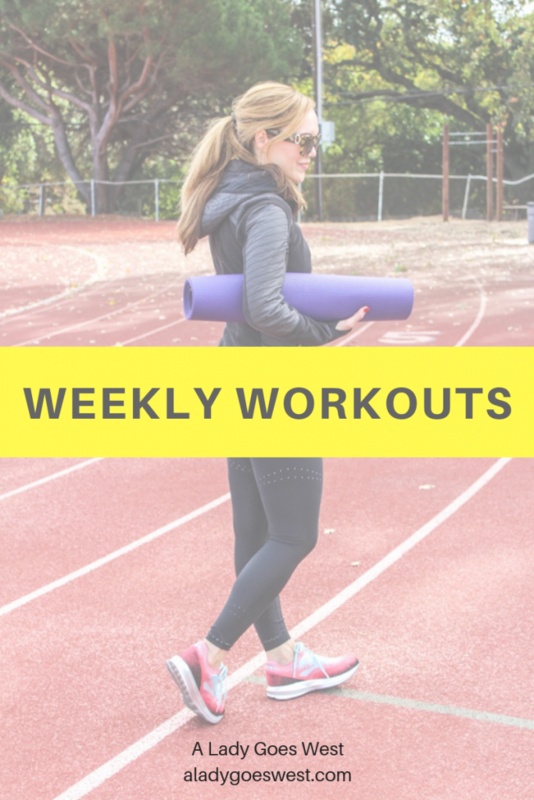 While I don’t do that any longer, I can’t forget that a lot of my readers came to A Lady Goes West when searching for Les Mills content, so I have to mention it every once in a while — and you guys know I love Les Mills — both taking and teaching it. Track 1: The warm-up song is super fun, and the choreography is repetitive in a good way. I think it’s the perfect way to welcome people and get them moving. The song combined with the moves just puts me in a good mood. And I like doing some jump-jacks in the warm-up to get started right away. Track 2: The mixed-impact track is also fun, and the squat jumps with turns in there are really effective. The fun arm-lines are always good with me — I love that type of choreography, and I can tell that my participants love it as well. Track 4: The peak plyometric track is INCREDIBLY difficult, and I’m so glad they only added the tuck jumps to the last set — there are soo many plyo lunges, it’s deadly, and it’s definitely the hardest track of the release. Not a lot of recovery either, because the “recovery” is running in a square pattern. The moves go very well with the music. 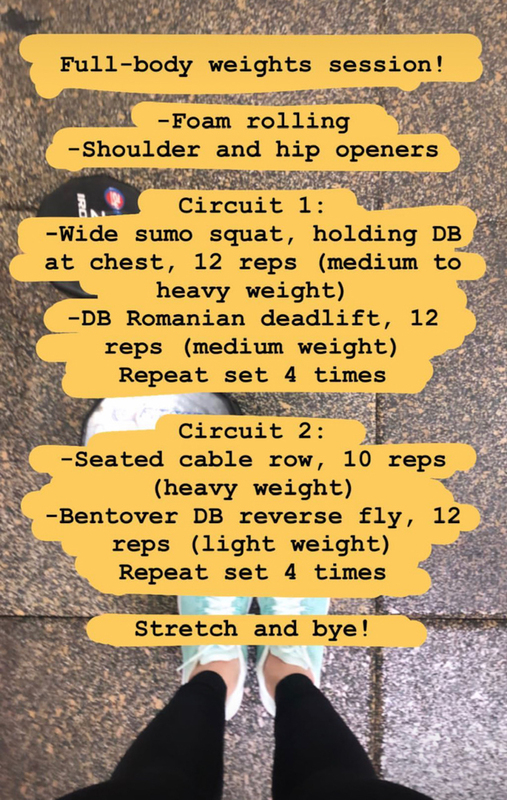 Track 5: I actually think the athletic conditioning track is perhaps on the easier side, but I’m a-okay with that, because the legs need a little bit less intensity there, and the plyo push-up is the perfect upper-body challenge. Track 6: My beef is with the running the track — I find the side-step-over awkward, a little uncool and way too repetitive — I wish there were side lunges or something different in that portion. Participants seem a little over this portion too. Track 7: I’m loving the agility track, and I think the partner work is spot on — not to mention this track is easy to learn and coach and is easy for participants to follow with the three clear succinct sets with only one move each before the ski jumps. The up-jacks are different and quite hard at that point too. The song is fun. Track 9: The power track is fine. I like all the running and jacking and burpees, but for some reason this track doesn’t have any wow moments for me — I guess the surfer burpee is a bit innovative. It’s solid though, and I like the song. Track 10: The core track is a fun — I’m always a fan of a mostly hover/plank tracks with minimal crunching. Track 11: Always love a cool-down. We all should! From an instructor’s standpoint, I thought BA 104 was pretty easy to learn with the choreography, because everything goes well with the music and there’s a lot of repetition. However, it’s still tough. A great release and one that I’m a total fan of! Have you done it? Second side note of this one: I am so happy I’m back to teaching BODYATTACK. It’s such a challenge for me in every way, and I am working very hard, but enjoying it. I use honey every single day in my morning tea and in my afternoon matcha latte, because you guys know I like things sweet. And I always buy different brands of local honey made here in the Bay Area. 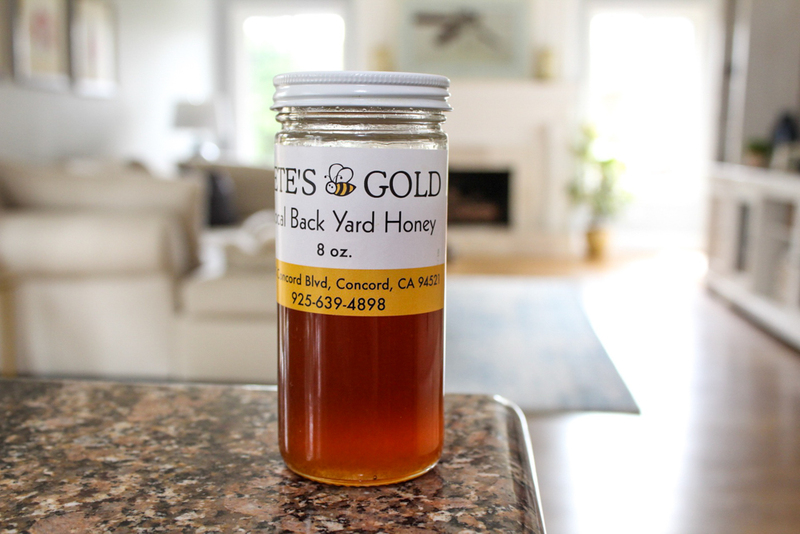 My current honey of choice is made in Concord, and the ingredients label includes nothing but raw honey. And for the cool part: It’s been said that when you consume local honey from your area, you have a chance of increasing your immunity to local seasonal allergies, due to the local pollen. In addition to that, honey has antimicrobial properties and can be used to treat the skin; it also helps treat coughs, sore throats and has vitamins and minerals too. Oh and it adds some sweetness to your food and beverages, obviously. By the way, local raw honey isn’t safe for pregnant women or babies, because it’s not pasteurized, so be careful there. 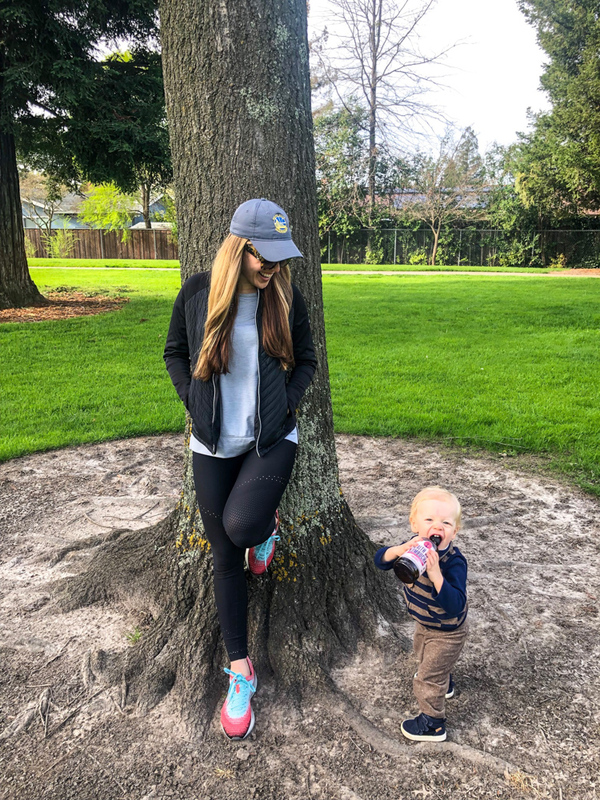 Over the weekend, Dave, Brady, Rudy and I walked over to a local park to hang out for the afternoon, and watching Brady run around the grass and try to follow every single dog was so darn adorable. It was his first time running free like that out in the open away from home, and he was so excited. I literally love taking him to new places and watching him observe his surroundings. The sweetest man ever, always providing a good laugh. I bought this purse for my Las Vegas trip a few weeks ago, but didn’t end up using it until after the trip. It’s got a chain handle that can be made into a shoulder bag or a cross-body bag, which is super convenient. 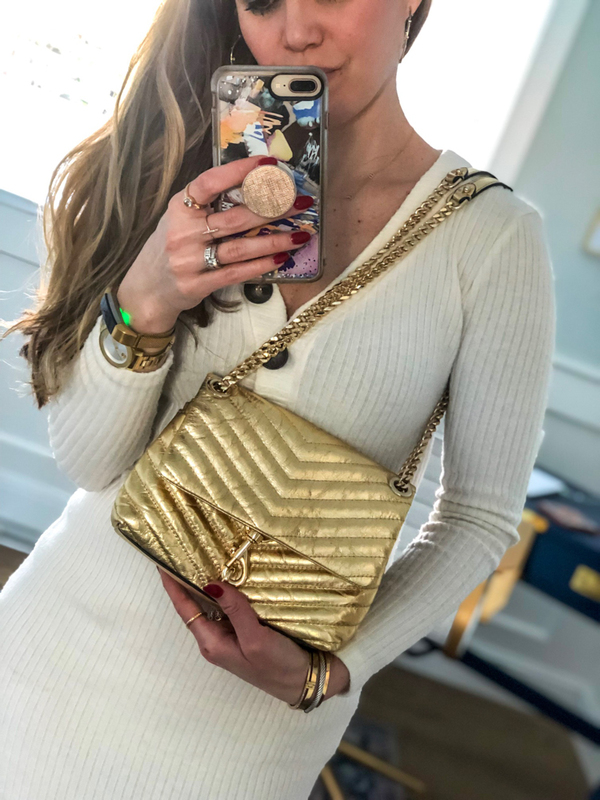 It fits just the necessities and has the nicest gold shimmer too. Such a fan. Because I usually have a big diaper backpack or my gym bag with me at all times, when I get the chance to use a small purse, I feel a weight off my shoulders. Anyone else? I can’t get enough of this multi-purpose Beautycounter product, and I look forward to putting it on my face at night as an end-of-the-day-you-can-relax ritual. You can clean your face with it or use it as an overnight skin mask too, which is how I normally do it. It smells so good — definitely a great one to bring on the road, because it can serve in many ways — and the tub may be pricey, but it lasts forever. If you want to know more about Beautycounter, send me an email, or sign up for my safer beauty email list here. And by the way, Beautycounter has a 60-day return policy, so you can always order something and send it back if it doesn’t work for you. Thursday: Taught 1-hour barre class, 12 p.m., practiced 20 minutes of BODYATTACK, 4:30 p.m.
Saturday: 30 minutes of BODYATTACK, 10 a.m. This past week was much lighter than the week before, with only one workout a day (except for one extra short practice session), a full rest day and some good variety. I tell you what, now that I’m teaching classes on Tuesday, Wednesday and Thursday, all of which require me to do the workout, I haven’t really figured out the best time to fit in my resistance sessions so that I don’t skip them. The struggle is real. Cold water vs. hot water. 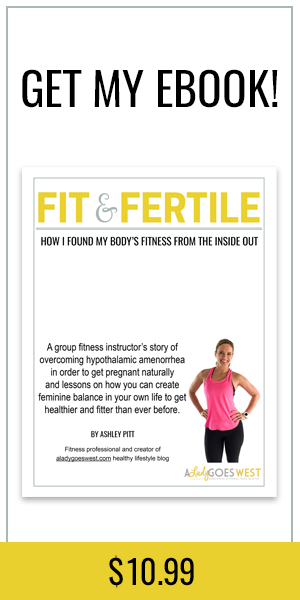 When I was healing my hormones, I was avid about only eating warm foods — no sushi, no salads, no smoothies — so I totally understand the point about drinking only room temperature or warmer water to help your insides. More on that topic here. PB pump. I shared this one in the A Lady Goes West Friends Facebook group a while back and forgot to share it here. What a great invention to be able to pump peanut butter straight from the jar. I want one! Brain health. This podcast episode of The Model Health Show featuring Chalene Johnson is so eye-opening, because Chalene talks about how she was anything but healthy, even when filming fitness videos and being a health expert up until very recently. Why? Because she wasn’t worried about longevity or her brain health, just about aesthetics, but now she is worried about being truly healthy instead of just looking fit. Such a good reminder that health looks different on everyone, and being FIT does not mean you are healthy. Have a wonderful day and weekend, my friends. Thank YOU for stopping by ALGW today! I truly appreciate you! P.S. Congrats to Susan H. for winning the protein cookie giveaway. More giveaways coming soon! Have you read any great articles lately worth sharing? Have you ever taken BODYATTACK? I was getting worried that Attack 103 was a sign of things to come (few ‘classic’ moves, challenging mixed impact, impossible plyo, demanding running AND unforgiving power track), but 104 was a very welcome relief. The aerobic and interval tracks are fantastic (Superman hooray! Knee kick woohoo! ), and frankly I don’t know how you can teach the plyo and power without those preceding tracks! 🙂 This release is much less intimidating for beginners, but also as a 7 year veteran doesn’t make me feel like a failure if I can’t manage every high move (I sustained an ankle injury trying to keep up with all the lunges and tucks in 103). Personally, the music was also a huge improvement, and I was relieved to see NO gallops in the mixed impact and only a few ladder runs in the agility track. They only thing they could have done to make it a new favourite would have been a few burpee tucks, but I’m not complaining 😉 So for now 85 still stands as my overall favourite release, but this isn’t far behind.